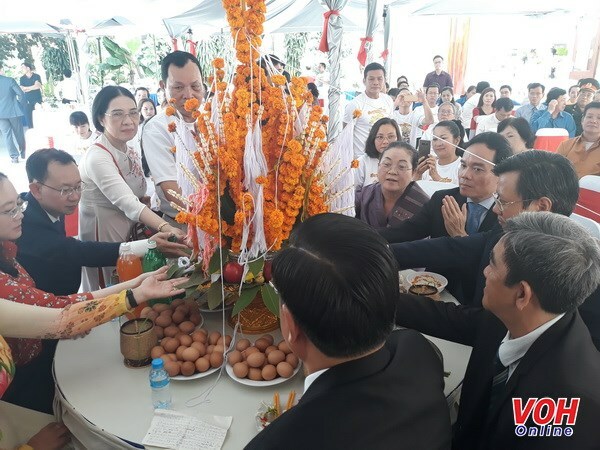 HCM City (VNA) – Permanent Vice Secretary of the Ho Chi Minh City Party Committee Tran Luu Quang and other City officials on April 9 visited the Lao Consulate General in the City on the occasion of the Lao traditional New Year festival Bunpimay. At the meeting with the Consulate General’s staff, Quang said he is happy with the growing friendship, cooperation and special solidarity between HCM City and Lao localities, saying it has been contributing to deepening the special solidarity between the two countries. He said he expects the staff would work together with HCM City in fostering the friendship, special solidarity, and comprehensive cooperation. New Consul General of Laos Phimpha Keomixay thanked the Government and people of Vietnam for their assistance to Laos, and expressed her hope that HCM City would continue assisting the Lao Consulate General in the coming years. Phimpha Keomixay said the Lao Government and people wish that Vietnam and HCM City would organize more exchanges to cement and develop the sound traditional ties between the two countries.